Fall is in the air and pumpkin is everywhere. When the weather gets cooler, I tend to start craving pumpkin flavor. It first starts with a pumpkin latte, pumpkin yogurt, and before I know it I want a piece of pumpkin pie. The next thing that I know, somehow 5-6 cans of pumpkin are in my pantry. I tend to go crazy with buying that canned pumpkin as my pumpkin cravings are real. Even the teenager starts requesting a pumpkin pie for his birthday which is in October. I can't make the first pumpkin pie until the teen's birthday so it stays special to him. So to satisfy my pumpkin craving, I make pumpkin bread and it better be healthy as I tend to eat way too many slices. When ever I make pumpkin bread, my husband won't eat it unless there are chocolate chips in it. My pumpkin bread also does not contain all those spices like nutmeg, cloves, and cinnamon as I don't like those spices. I no longer get my pumpkin coffee at a certain coffee shop as once they change their recipe to pumpkin spice coffee, it just ruined it for me. 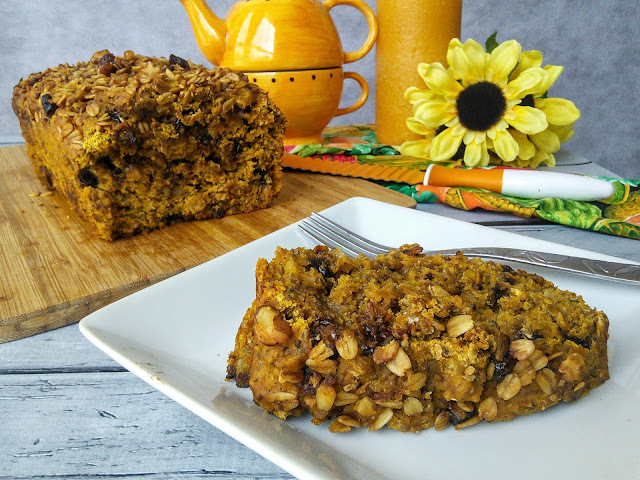 This year I decided to add a twist to my pumpkin bread recipe and add granola and chia seed for a healthy crunch and omega/fiber boost. Of course, since I am making this bread healthy, I will be using olive oil for the small amount of oil that this recipe calls for. 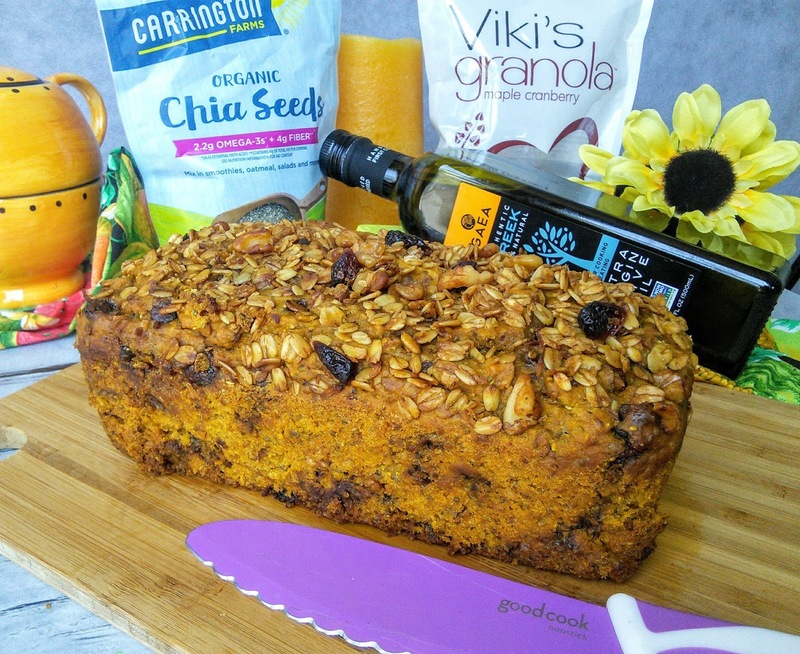 The granola and the chia seed give my pumpkin bread a unique crunch. The awesome thing is my husband had no clue that I put the chia seed into the bread and he enjoyed the bread. The olive oil is new unique Greek Extra Virgin Olive Oil that I just discovered and I love that I can bake and cook with it while getting those healthy fats into my diet. 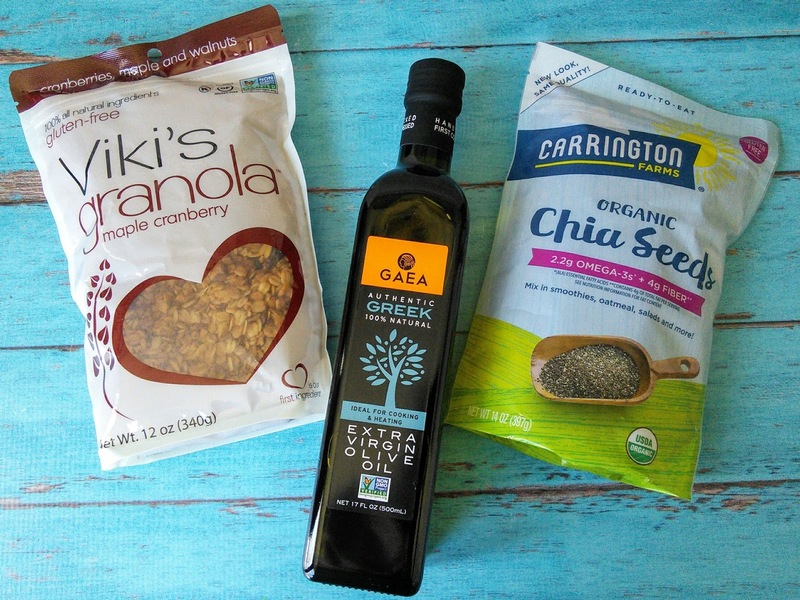 Sponsored post: I received products from Viki's granola, Carrington Farms, and Gaea to facilitate this post. I used a delicious cranberry, maple and walnut granola from Viki's granola as I just love the generous amounts of cranberries and walnuts in it. These two items just blend in perfectly with the flavors of pumpkin and chocolate chips. The granola gave my bread a wonderful texture along with a delicious taste. The granola also makes the top of the bread so pretty. When my nine-year-old son saw the bread, he told me that the bread looks awesome as he ate two slices. My nine-year-old takes all my selfie photos and so understands about things looking good. 1. Lightly brush a loaf pan with olive oil. 2. In a large mixing bowl beat the oil and honey together. Add the yogurt, beat to combine, then beat in the egg. Make sure the ingredients are smooth and well blended. Beat in the pumpkin purée and vanilla. 3. Combine the baking soda, salt, flours, and chia seeds in another bowl and then mix well into the pumpkin mixture. 4. Stir in the granola and chocolate chips until well coated. 5. 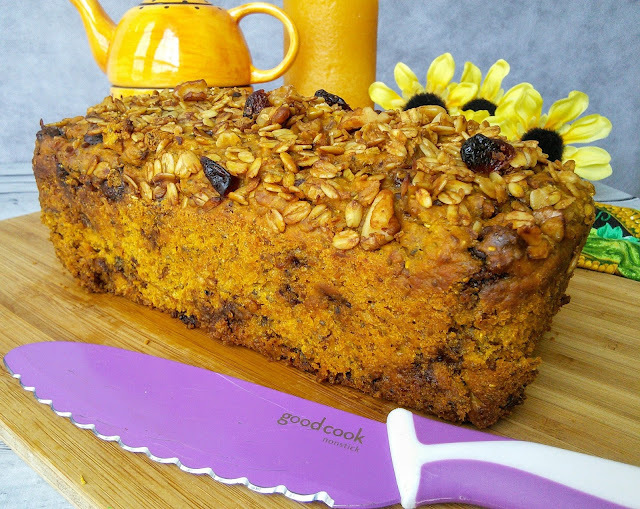 Spread the batter into the prepared loaf pan and lightly sprinkle the top with some granola. This looks so delicious and easy to make. I am sure it will be a big hit in my house. I am always looking for healthy recipes to try. I am going to let my boys have a go at making this as they love cooking. It does look so tasty and I have actually never heard of doing it before. 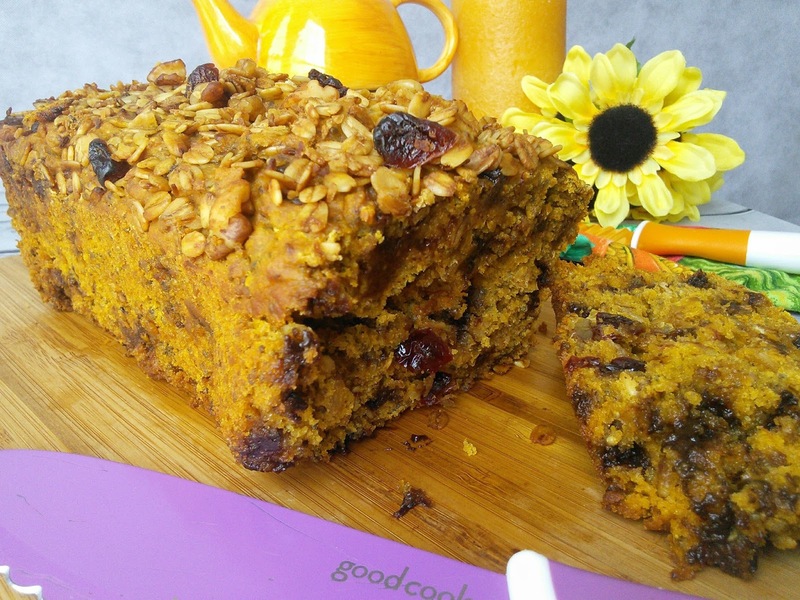 I am in love with fall season because of this kind of recipes! I will definitely try this, looks so yummy! I would love to make this bread! I am always on the lookout for healthy recipes that actually look good and this is one I will have to pin for later. This looks so good! I love that you have cranberry, walnuts and chia seeds in it. I must try this. Now I have a recipe for pumpkin bread, but it doesn't have any chocolate chips in it! I will try this one, thank you! I love pumpkin and use it very much in my recipes as well! This looks yummy! I am always on the lookout for new recipes, and this sounds delicious. I am going to try it! This sounds like a great fall recipe. I like how you incorporated chia seeds. This appears to be a great recipe for the colder months. The fall season is peeking through upon us. This is perfect for that season. Hmmmm. I never thought about combining chocolate and pumpkin. I bet my kids would love this recipe. Forget being healthy, you had me at pumpkin lol. I love the pumpkin and chocolate combination. It's soooo good! My kids will surely enjoy these treat. It looks tasty and delicious. I can't wait to prepare this for them. Thanks for sharing! Looks delicious! I want to maje this too, but I will omit chia seeds. Thanks for sharing!